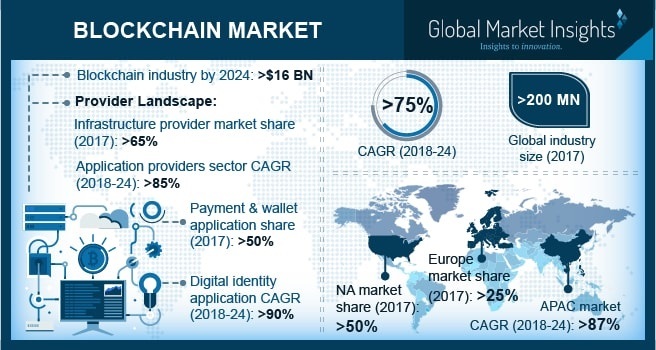 Blockchain Market size is set to exceed USD 16 billion mark by 2024; according to a new research report by Global Market Insights, Inc. The increasing investment by the venture capitalists in the blockchain technology is a major factor propelling the market growth. A glut of investor interest has led to the explosion in the blockchain market space. In 2017, approximately USD 1 billion investment in the blockchain start-ups with more than 185 deals across the globe has been witnessed. The number has significantly increased from the USD 545 million investment with more than 135 deals in 2016. This encourages the development of the cutting-edge technology and accelerates the adoption among the industry verticals. The growing trend of Initial Coin Offering (ICOs) also supports the blockchain market growth. The blockchain companies started to offer ICOs as the sale of coins & tokens and to raise funds. In 2017, the initial coin offerings have raised more than USD 2 billion with over 250 ICOs across the globe. This token can be subsequently traded on the cryptocurrency exchanges. It provides an early access to the potential blockchain protocols and applications. This is encouraging the investors to invest in ICOs. The smart contract is also one of the prominent applications of the blockchain market and is estimated to grow at a CAGR of over 80% during the forecast period. Smart contract assists organizations and individuals conduct transactions of property, money, and shares in a conflict-free and transparent manner, eliminating the services of middlemen. It offers parties involved in the agreement with autonomy, safety, backup, speed, and accuracy. The smart contracts can be implemented on distributed ledger or non-distributed ledger systems. Blockchains are a form to distributed ledger systems, which make it impossible for a single party or a group to reverse the transaction once recorded in the database, eliminating the need for intermediaries to authenticate and settle transactions. The government sector is anticipated to grow significantly during the forecast period with a CAGR of more than 85% during the forecast timeline. The blockchain market growth is driven by numerous benefits offered by the technology. The blockchain offers three value propositions for enterprises, recordkeeping, value transfer, and smart contracts. It provides a unique & non-corruptible record management system that tracks and validates changes. It can also reduce the number of intermediaries and increase the trust between the transacting parties, increasing the efficiency and reducing the time& cost to process. The Asia Pacific blockchain market is estimated to attain a noteworthy growth with a CAGR of over 87% during the forecast timeline. The market is driven by increasing investments in the blockchain technology by venture capitalists. The government initiatives and policies are also augmenting the demand for the blockchain technology in the region. Furthermore, increasing number of the blockchain start-ups and ICOs in the region also propels the blockchain market share. The key vendors of the blockchain market are IBM, SAP, Ripple, R3, Microsoft, Abra, Alphapoint, Amazon Web Services, Asta Solutions, Bacoor, Bitfury, BitSE, Blocko, Blockstream, Bloq, BTL Group, Chain, Coinbase, Digiledg, Digital Asset Holding, and Earthport. The market is characterized to be highly fragmented due to the presence of both multinational companies and regional start-ups. The players are leveraging on the partnership and collaboration strategies to expand their product portfolio and increase their customer base. For instance, in 2016, the Chain, Inc. collaborated with the Visa, Inc., a global payment platform provider, to develop blockchain based cross-border payment solutions for the enterprises. Similarly, Peer Ledger partnered with SAFE- BioPharma association to develop the blockchain based solutions to enhance the health transaction security and protect the patient’s identity using the identity bridge product.